The Poker Chips I picked up at yard sale a couple weeks back have been sitting on the little table waiting for me to establish a container for them. I picked them up to put away, and then got to thinking about their potential. The center area is perfect for design, and the plastic is quite thin, which makes it great for drilling of holes. So, that's just what I did ... took a handful of them out to the garage (whereI have a little drill area setup), and drilled some holes with my Dremel. I started by finding a round object that matched up to the center area. I selected one of the childrens books I have in inventory (wonderful colors/images in the pictures) and cut out 4 rounds, which I glued into 2 of the Poker Chips; one on each side. Checked after they had dried well and decided the paper is too thin. Poker chips have a slightly raised pattern and this pattern shows through the paper. But, not to be discouraged, pulled out one of the books of grafitti painted papers (which I'd painted last year) I have on my bookshelf, selected a sheet and cut out 6 rounds, which I glued down to the blue chips. Dried up and they look good; the underlying pattern does not show through. Decided to try some poster paper as well ... I have a good number of posters in paper inventory. For some added interest, cut these rounds with a scrapbook paper punch and then trimmed to fit into the center section and glued into place. These look good as well. Applied several coats of sealant to all five of the chips; both sides. My plans for the day was to reorganize the studio a bit ... I feel like working on some more wrist cuffs. 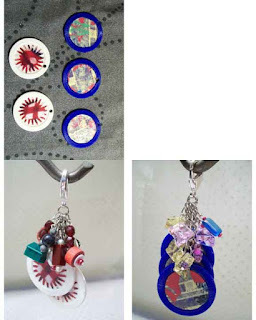 But, hated to just drop these into inventory, so I pulled out some found objects and beads and put together another two Pulls. One Pull has little green Monopoly houses and red round wooden game pegs from someother game (which I know not the name), along with misc beads from inventory. The second Pull has pink and round plastic gem things (I have no idea what they are, other than cute, shiny and durable) which I drilled holes into to make beads, along with other misc. beads. Everything on these except the clasp, chain and findings are found objects ... yep, even the painted pages ... I pick up the paint and paper from everywhere.